Gladly with proud we want to introduce you with our newest and best instructor courseTo become an krav maga /combat skills instructor. For several gyms/schools there is a possibility to become the head instructor of their countryTo start up The organisation and to make it big. 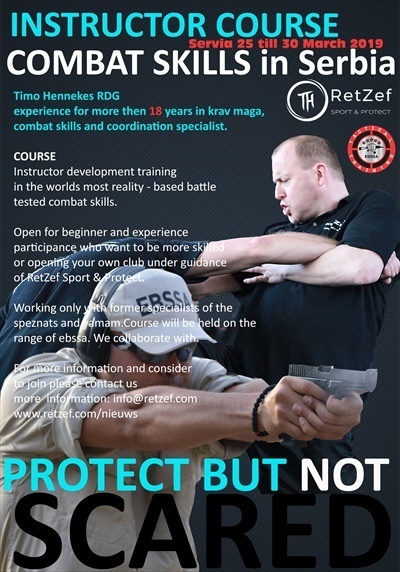 For outside countries we ask no fees for being member of our organisation RetZef Sport & ProtectWe ask only a year to organize a nice seminar with enough attendance where we can meet and learn. If you have any question about this course let me know asap.We go till 14 attendance only for this course because there is also shooting involved. Information:Combat Skills Course (Instructor Course first level) Highly qualified instructor's former Russian Special Forces antiterrorism unit, more than 18 year experience in Krav maga and more.Join Us! Train with The Best! Be the Best!